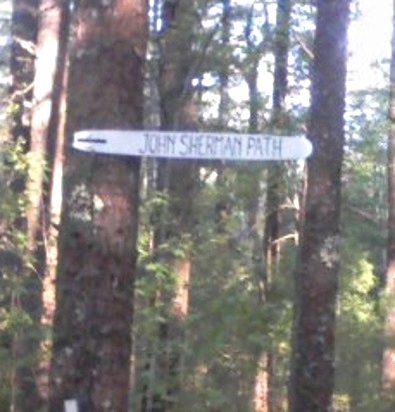 In among the Camp Wing Conservation Area's hiking trails lay the John Sherman Path. From the roadside parking area on Franklin St., just inside the forest, on one of the wide conservation trails, the John Sherman Path winds it's way deeper into the forest. The hiking trail is well marked by white rectangles. The start of your journey here will be easy stepping most of the way until an occasional tree root disturbs the pine needle carpet. Soon though, the trail starts a light descent that becomes increasingly more noticeable. My first journey on this trail was early morning. will let you know different. on this hiking trail look lush, almost tropical. out by past glacial activity. 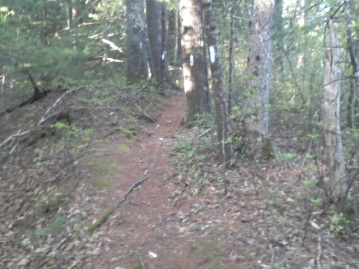 Shortly after, the trail wanders through an area that has had massive tree clearing, no doubt due to past harsh winters. The trail then takes a sharp left. There is a trail that leads straight here but is blocked by fallen trees. 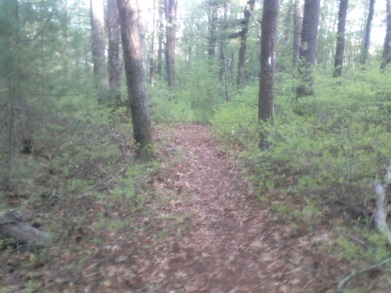 This blocked trail leads to other trails in Camp Wing and could be used as a shortcut to make a smaller excursion. 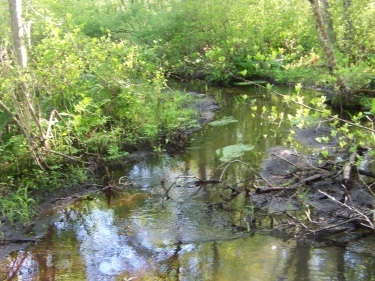 At 4/10 mile a side trail to Phillips Brook leads to the left. This trail is slightly more narrow than the John Sherman Path. It even looks to be fairly new. It comes to a rather large pine and the trail is almost lost here, but takes a right through an area that becomes increasingly wet. Very short side trip that is certainly worth the effort. Back on the main trail the path now takes you over a series of planks over more wetland. 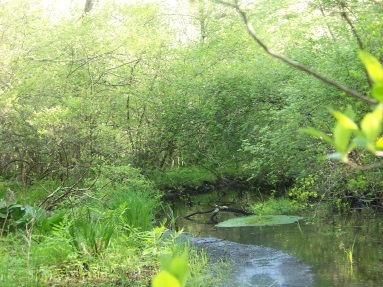 The trail continues it's meandering nature and at 3/4 miles brings you to a Holly tree. Shortly after that another field of ferns with planks to ease you over a slightly flowing stream. More planking to ease you over wet hiking trail areas. 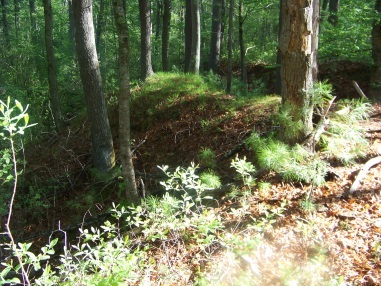 Thinned out forest may provide a wildlife viewing area. At 9/10 mile another shortcut leads to the right. 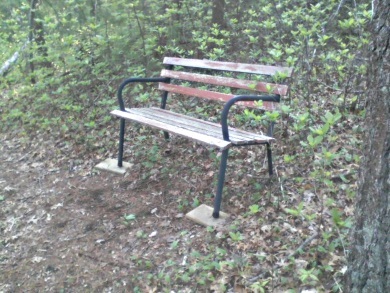 Just after this small trail a bench on the trail will be found. The forest is a bit thinned here so sitting for a while could lead to possible wildlife sightings. At 1.10 miles there will be another moderate climb and the path becomes very narrow. 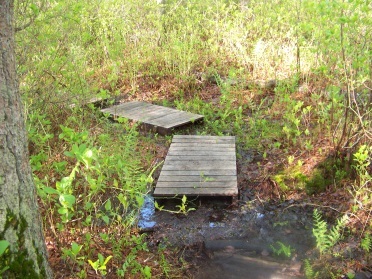 The trail is almost blockaded by some small pines, then runs along the top of another glacial irradical on the right and the edge of a marsh on the left. It sweeps downward again and seems to end at the junction of the Camp Wing Conservation trail. On another hike I found the faint marks of the white rectangle across from this junction where the John Sherman Path continues along the marsh and into the forest again. The trail runs for another 1/4 mile and then once again joins the Camp Wing Conservation trail. 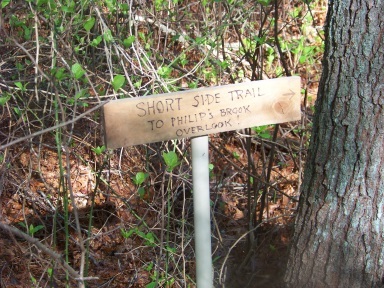 Here another sign marking the trail can be found along one of the red loop trails. 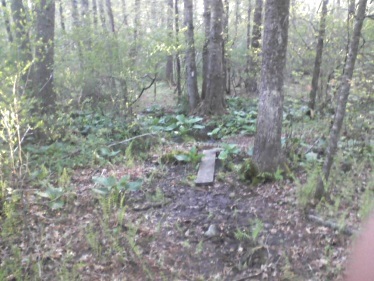 A look up the John Sherman Path from it's intersection with the blue rectangle trail of the Camp Wing Conservation Trail.